When addressed properly and given the proper attention, the annual unclaimed property reporting and escheatment process does not need to be a burdensome experience.  Organizations of all sizes are required to file annual unclaimed property reports and comply with state escheat laws. With little to no uniformity among states, it is imperative that organizations understand their reporting obligations in order to stay compliant. Identify Common Challenges & Risks. As many as 65% of all organizations are out of compliance and risk costly and burdensome audits. Review the pain points experienced by many companies struggling with the annual escheat reporting process. The annual reporting process doesn’t need to be a painful one. Explore how your organization can alleviate the strain on internal resources and achieve compliance in the process. "Unclaimed Property Reporting: Obligations, Challenges & Solutions".